Gatefield Hall: maximim capacity 250 people. Jubilee, Sydney and Batterbee Rooms: maximum 30/40 people. Hall with capacity for 80 people. Disabled access available via a lift and two stair lifts. Various rooms available and outside areas, with lots of parking. In-house catering can be provided. Corner of Bysing Wood Road and Wildish Road, Faversham. Main hall for 300 people (theatre-seating arrangement) or 175 for dinner, plus range of meeting rooms. Kitchen, bar and disabled facilities. Hall with capacity for 120 people (whole hall). Smaller function room capacity 40 people. Larger function room 80 people. Kitchen available for preparing food and hot drinks. Available every day or night except Christmas Day / Boxing Day and New Year's Day. Rear of the Fleur de Lis Heritage Centre in Preston Street, Faversham. This first-floor hall is a comfortable, centrally-heated, well-equipped venue, with room for up to 80 people. It belongs to the Faversham Society, a charity run by 100% voluntary effort to help care for the Faversham area. In a newly refurbished kitchen, crockery, electric kettles and a refrigerator are provided. An electric wheelchair lift is available. A slide and/or overhead projector and screen are available if booked in advance. There are plenty of tables and chairs and the floor is carpeted. 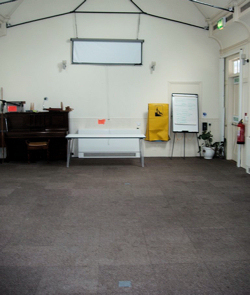 This venue is suitable for most events, such as day and evening classes, Yoga, and quizzes. There are toilet facilities on the ground floor with disabled access. 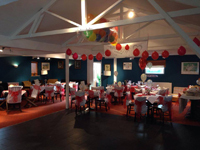 Available to hire with bar, kitchen and excellent facilities for functions for up to 80-100 people. We may also be able to offer space for a marquee, should you need more space. Unfortunately we do not currently have disabled facilities. 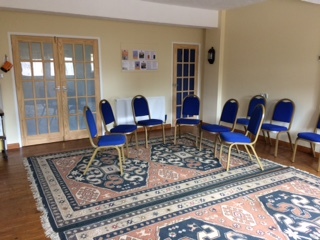 Subud House, Faversham, contains 2 small halls, on separate floors, each approx. 30 sq. m. In area. Facilities include a kitchenette, a toilet on each floor, seating and tables, carpets and Central heating. Subud House is well maintained and has a comfortable atmosphere but has limited disabled access. Hall with capacity for 100 people. Hall with capacity for 300 people. 10 x 20 metre sports hall with basketball nets, and floor marked for court activites, including badminton, short tennis and five-a-side football. Hall with capacity for 60 people. Eastling lies between the M2 and the M20 just four miles southwest of Faversham and 15 miles from Ashford and Maidstone and deep in the beautiful Kent countryside. Its location in quiet rural areas, yet close to the main road network, makes it an ideal base for that special business meeting or conference. The main hall has the capacity for over 100 people and a separate smaller committee room ideal for a group of about a dozen. The hall has its own kitchen and is well equipped with basic utensils and crockery. Contact Hayley Brookland-Beck 01795 890968 to find out about availability and current rates. Contact Mike Skipper - 01227 750842. The hall is well equipped with tables and chairs for up to 80 people. It is available for both regular and individual bookings. Equipment: 80 chairs and 20 tables, portable stage, cine screen, short mat bowls mat. Kitchen “ Double oven and hob, refrigerator, microwave oven, tea urn, kettles, a limited amount of crockery and cutlery. The hall is ideal for children's parties, social gatherings of up to 80 persons, dance and movement classes, meetings and charity functions. Contact Mrs S. Smart - 01227 752301. Hall with capacity for 110 people. Contact Helen White - 01795 536990. Hall with capacity for 150 people. Newly built in 2014 equipped with 2 ovens, electric hob, fridge/freezer, crockery and cutlery for 80 people. Newly refurbished, Teynham Community Hall (formerly the Labour Hall) is a well established and much loved hall that has served the village for over 40 years. It is suitable for all types of functions for up to 100 persons with tables and for dancing or 150 persons standing or close seated. The Main Hall is approximately 25' (7.5m) wide x 58' (17.5m) long with a good maple wood sprung floor suitable for dancing. Chairs and tables are provided. There is a 25' (7.5m) wide x 12' (3.7m) deep raised stage suitable for theatrical functions and shows. Dressing room facilities may be obtained by curtaining off a side section of the hall adjacent to the stage. There is a piano for use and a public address system. Serving and bar areas are available along with a kitchen having refrigerators, a cooker, microwave and water boilers. The Hall can provide cups, saucers for around 70 persons and limited cutlery. Plates, crockery, cutlery for larger functions need to be hired from caterers as required. A licensed Bar may be arranged through the Designated Premises Supervisor. If you are planning to book the Community Hall for your club, group or society meeting, reception, evening party or special celebration, such as anniversaries and birthdays, please do it well ahead to avoid disappointment. The Hall has a full Premises Licence and a Performing Rights Licence. www.teynham.org. 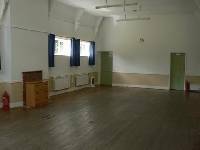 Teynham Village Hall has a large Main Hall, suitable for all types of functions and a smaller room, designated as a Committee Room, which is suitable for meetings and small functions of 15 to 20 persons. The Main Hall is approximately 39' (13m) wide x 66' 9 (22m) long and is licensed for maximum number of persons, including entertainers and staff, of 200. It is well appointed and has a fine polished sprung maple wood floor suitable for dancing. Immediately adjacent to the Main Hall there is a large kitchen area with a sizable serving hatch into the hall. The kitchen has three fridges, a four-burner gas hob and electric fan oven, and a plumbed-in hot water boiler. Outside caterers often have freezer cabinets available, additional cooking facilities and hot cupboards which may readily be accommodated in the space available. Full facilities are provided for disabled persons, including specially designated car parking areas.